There are a ridiculous amount of Avengers books on the shelves right now. There are the "Adjectiveless," New, Mighty, and Secret teams, along with the movie-themed Avengers Assemble. There are also related mini-series and related ongoings like Avenging Spider-Man and Avengers Academy. It’s difficult to figure out who’s on which team at once, similar to the dread one feels when discussing late-1990s X-Men. However, Secret Avengers justifies its existence by having a very different purpose. Similar to the current incarnation of X-Force or what Justice League Elite was supposed to be [gosh, I liked Justice League Elite -- ed. 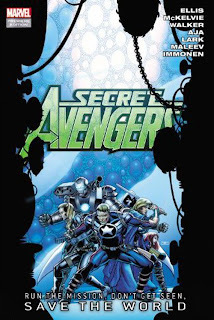 ], the Secret Avengers are the covert team, taking on operations they don’t want the world to know about. Ed Brubaker kicked off the series, followed by Nick Spencer during Fear Itself. During a gap between the Spencer run and Rick Remender coming on to the book, Marvel decided to have a little fun and, on Brubaker’s advice, bring in a very unlikely Avengers writer: Warren Ellis. For me, Ellis is at his best when writing team books, whether it’s Nextwave, Stormwatch, The Authority, Planetary, Black Summer or the late, lamented Global Frequency. Ellis decides to take the latter route, and Secret Avengers: Run The Mission, Don’t Get Seen, Save The World feels like volume 2 of that title. In every issue of Global Frequency (which I’ll be reviewing next month), Miranda Zero hand-picked a team of specialists to solve a world-threatening issue. They were aided by tech guru Aleph, and the situations ranged from kinetic missiles pointed at the Earth to biological engineering to Zero being kidnapped. For Run The Mission, Miranda Zero is replaced by Steve Rogers, Aleph is replaced by Beast, and the team to choose from is limited rather than the 1,001 specialists on the Global Frequency. Otherwise, the tone, the threats, and the story construction are very similar to Ellis’ previous title. He uses exactly twenty-two pages to tell the six stand-alone stories, ending each individual tale rather abruptly on that last page without any follow-up. The final issue of the run brings in elements of the previous five. Warren Ellis has an interesting take on superheroes. I don't think he outright hates them, like Garth Ennis does, but he has a pessimistic view towards them. Throughout the stories, it’s clear that Rogers’s team is often in over their heads, and they use trickery to take out most of their bizarre enemies. You’ll note that I’m using “Steve Rogers” instead of “Captain America”; that’s because, at this time, he was the director of S.H.I.E.L.D. He’s since returned to his old identity (to the surprise of no one), but his maskless, star-studded uniform is an interesting take on what he used to wear. The Avengers team remains mostly unchanged from the previous roster in the series (Nova sadly departed after the first arc; I wanted him to stick around). The only member taken out is Ant-Man, whom Ellis disliked, and the only addition to the roster is Shang-Chi in issue #18. The majority of the members are hand-to-hand combatants: Rogers, Sharon Carter, Shang-Chi, the Black Widow and Moon Knight. The team’s heavies are Valkyrie, Beast, and War Machine. It’s an odd line-up, but Ellis makes it work thanks to the former Captain America’s sheer force of will. Steve is in charge, and once the Secret Avengers get going, they’re unstoppable. Most of the roster remains underdeveloped, but then again, with Rogers, Moon Knight, Beast, War Machine, and Black Widow appearing in their own or other books, there isn’t enough room to make major changes. Despite this trade’s cover, Nick Spencer decided to remove War Machine’s iconic shoulder guns, perhaps the dumbest Iron Man-related costuming move since the S.K.I.N. armor. Rhodey seems distant in this book, distracted by the events of his own title, Iron Man 2.0 (a name I loathe). Black Widow is mysterious and snarky, Moon Knight is gleefully insane, Valkyrie loves her warrior nature, and Beast, as always, indulges in technobabble. Shang-Chi, in his one issue, is reluctant to work with the team, a hesitation Ellis later details. Sharon Carter is the odd-one-out, on the team primarily because she’s Steve’s girlfriend, but she too holds her own. One reason I enjoy Ellis’s Marvel books is that the man loves his Marvel trivia. Nextwave had all sorts of bizarre Marvel villains, and Secret Avengers keeps it going with the Secret Empire and a rogue Arnim Zola body, amongs others. The first story, for instance, uses a copy of Doctor Doom’s time platform from Fantastic Four #5 -- Doom’s first appearance. The villains’ schemes employ complex and horrific scientific processes, like bio-mechanical engineering factories and drugs which allow spirits to take over your soul. Issue #19 introduces the reader to Pilot Marko, a fanatic cyborg pilot who, in four pages, manages to completely steal the book away from the main team. Ellis can be relied on for strange, over-the-top action, to be sure. Perhaps the greatest similarity to Global Frequency is the art -- namely, having a different artist in each issue. However, rather than the somewhat random artist selection from that book, Marvel decided to have some of its major artists work on the book. In order, they are Jamie McKelvie (X-Men: Season One), Kev Walker (Thunderbolts), David Aja (The Immortal Iron Fist), Michael Lark (Daredevil), Alex Maleev (Spider-Woman) and Stuart Immonen (Nextwave). They have a variety of art styles, ranging from blocky to shadowy to cartoony, with each picked to match the story. Warren Ellis’ take on Secret Avengers will be sorely missed. He has, however, stated that he would return if Marvel wanted him to, so if there’s a publishing gap in the near future, Ellis can hopefully fill it. Secret Avengers: Run The Mission’s six stand-alone stories, with creative threats and top-notch artists, are some of Marvel’s best work of 2012. Just to pre-empt the "You hated JLE?!" comments... I did enjoy JLE (anything Joe Kelly does is almost guaranteed to be good), but I don't think it achieved its "secret, more violent team" goal as well as it wanted to. I actually thought you were complimenting Justice League Elite simply by mentioning it. *grin* Absolutely agreed it's a story/concept by Kelly that had a lot of potential, but petered out by the end. The gigantic wait between the release of the two collections was rather crushing, too. I loved the dynamic and roster of the Mighty Avengers myself. Is that book still around/brought back at the moment? You know, with Hank Pym!Wasp as the leader, Jocasta, Herc, Cho, US Soldier and co! Such a fun "not taking itself seriously" book. That crossover issue with the FF was classic! Mighty ended after Siege. However, Avengers Academy (coming up next week) is pretty much the successor, starring Pym, Jocasta and Quicksilver. "The Unspoken" was definitely in the running for Avengers Month, especially because I thought about moving this review to next month to coincide with Global Frequency. Don't forget that U.S.Agent is also the warden in Thunderbolts if you want to catch up with him. As far as USAgent go, I'd prefer having him in a more light hearted fun team, being the stoic no-fun-around soldier around 'n' all.